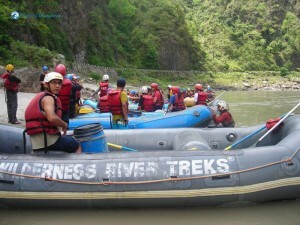 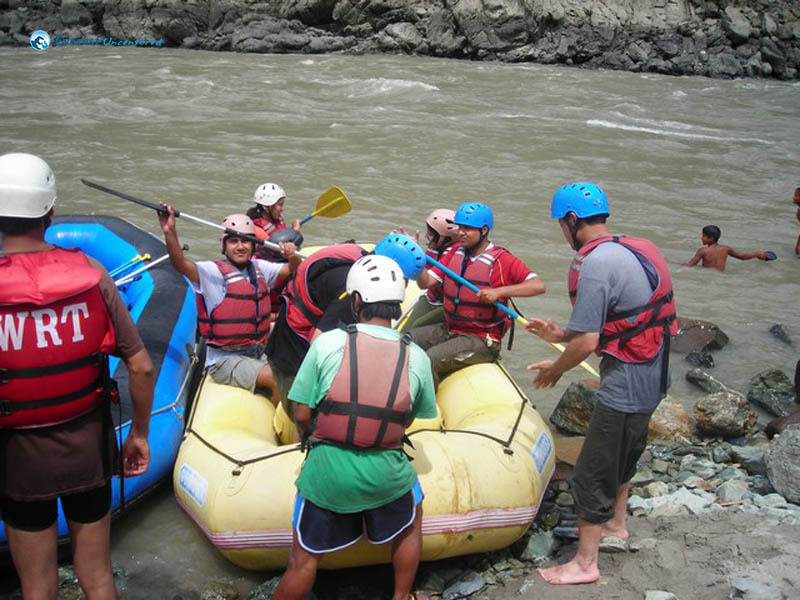 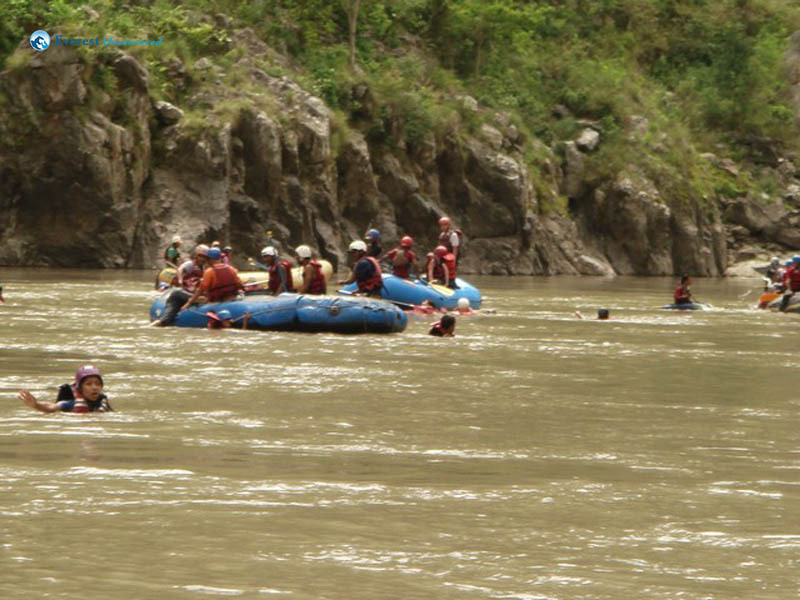 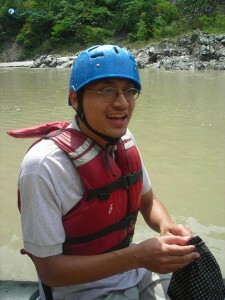 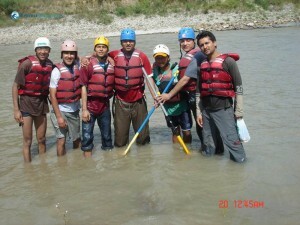 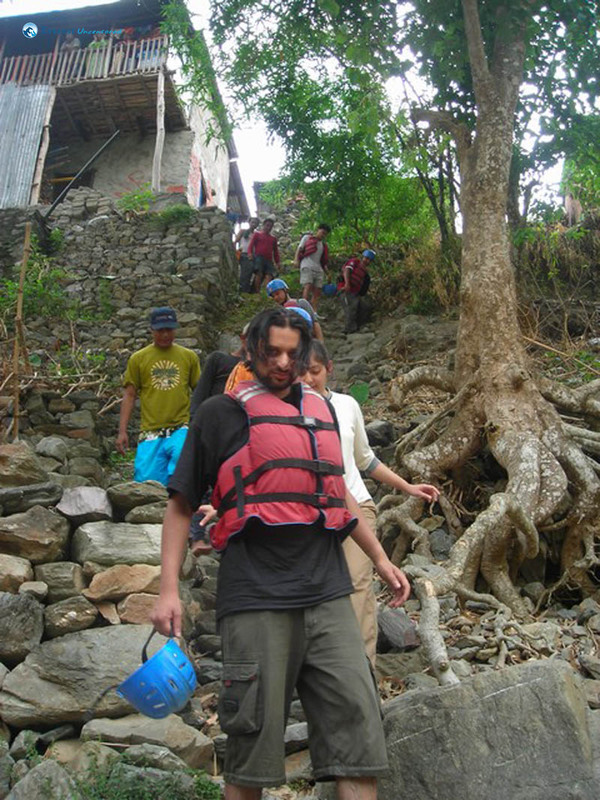 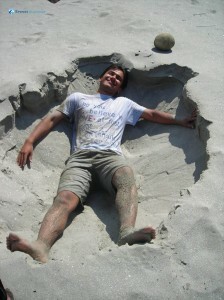 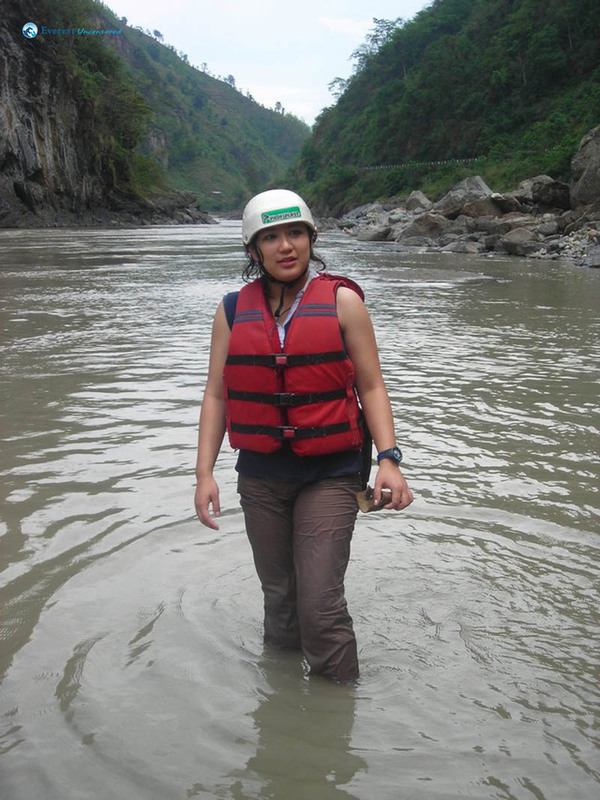 Rafting in Trishuli: Been There! Done That!! 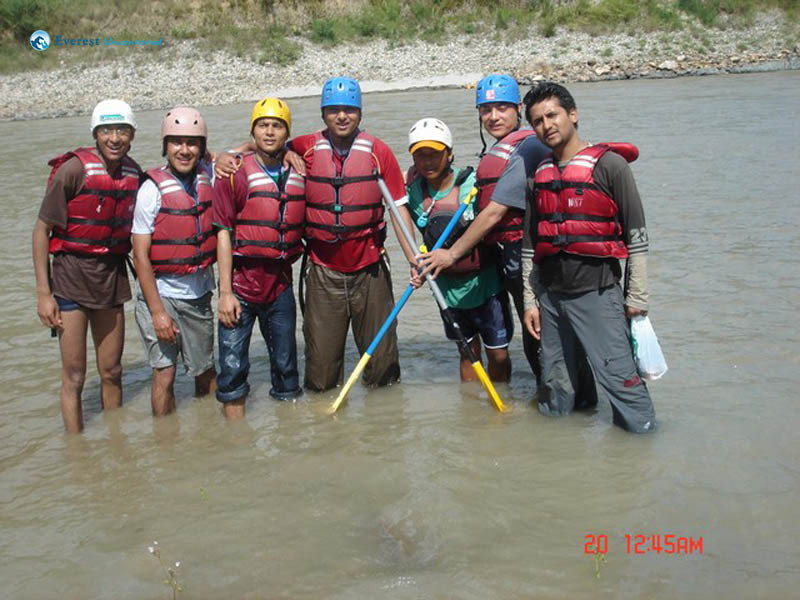 It’s been a week since we, some 27 colleagues, had taken the raft and battled the raging rapids of Trishuli on 20 May 2007, Sunday and memories of it still inject adrenaline in our blood stream. 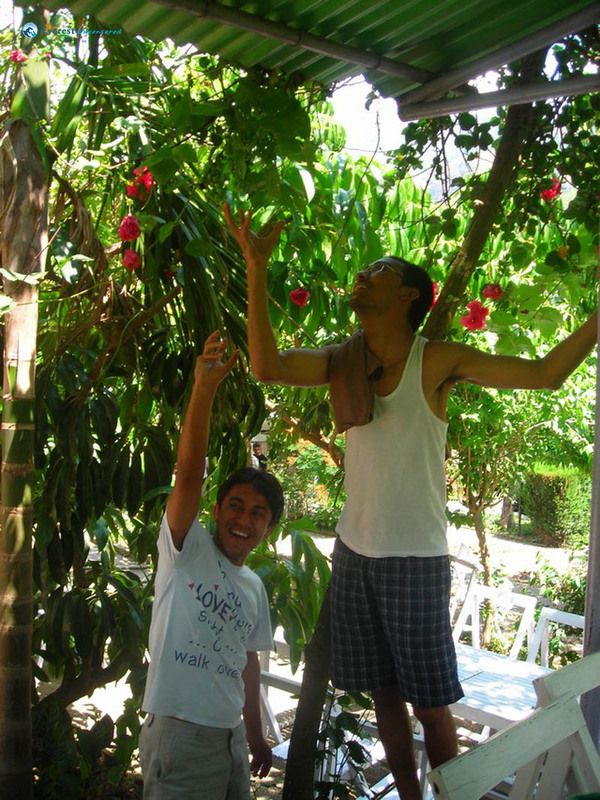 It was my year long desire to go on a raft and I had been pestering Prashant for quite some time to arrange a rafting session. 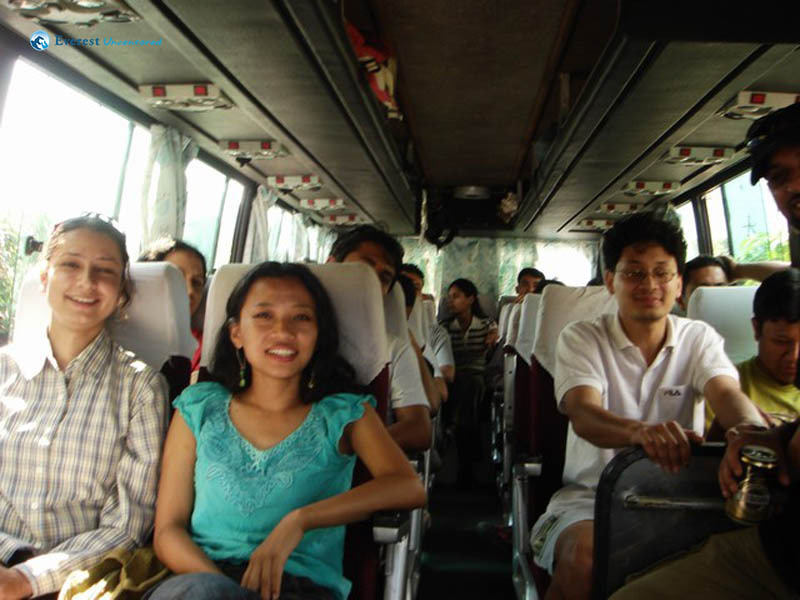 Finally it was May 20, when we boarded a bus heading to Charaudi, the starting point of our rafting course. 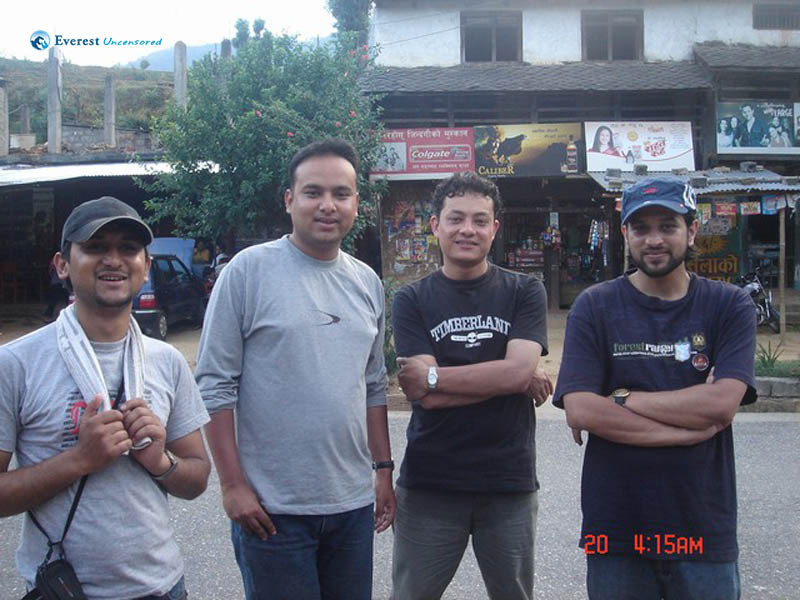 Making two pit stops at Kalimati and Kalanki where we picked up our adventure seeking fellow mates, we reached Charaudi after two and half hours’ bus ride. During the bus ride, as I clicked photos of the river we would soon be rafting on, I could feel the adrenaline slowly rising. 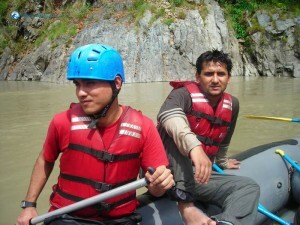 The very thought of the unknown is always coupled with excitement and apprehension. 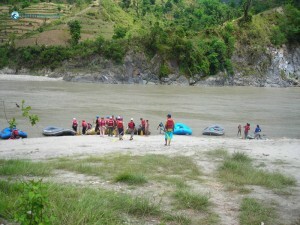 As I saw few rapids along the river, I must admit I was very intimidated by them. What if our raft gets stuck in the rapids! 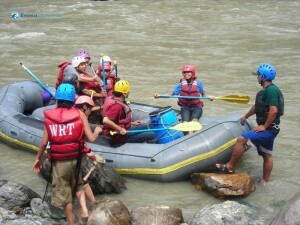 What if the raft overturns! 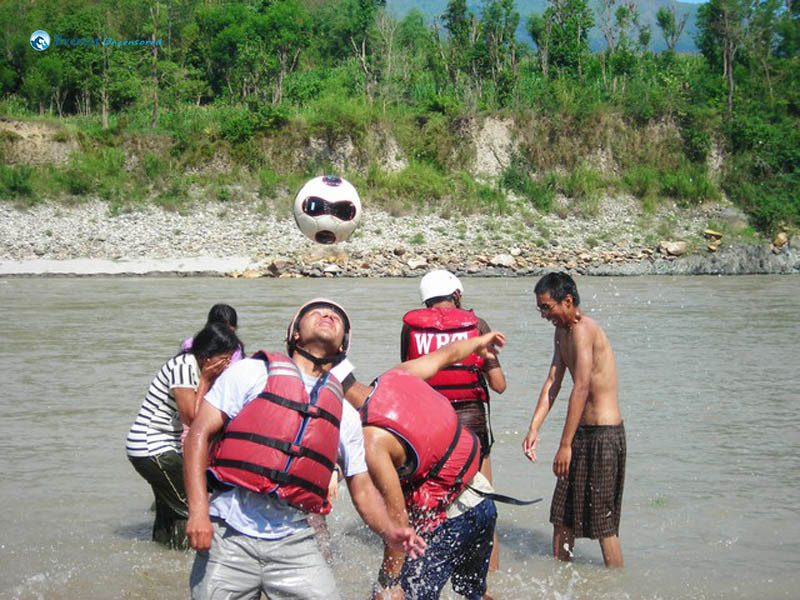 What if somebody falls into the river and is lost!!! As these nagging negative thoughts were making me go numb at my knees, I busied myself by taking pictures of more rigid, stable and ‘comforting’ bodies like the trees, houses and the hills. 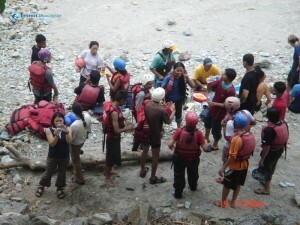 The bus stopped at Charaudi where we put on our rafting gears. 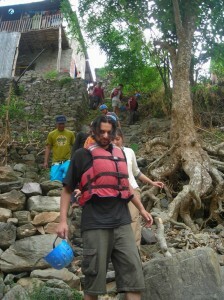 With an oar in our hand, we headed to the river bank. 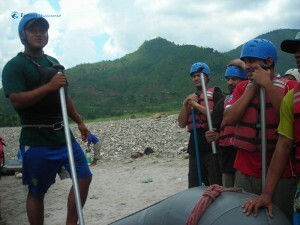 After a short lecture on rafting and instructions, we took on four rafts. 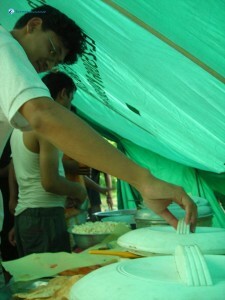 The commands seemed fairly easy. 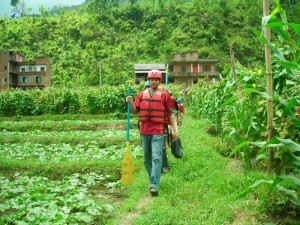 ‘Forward’– you just row forward, ‘Backward’ – you just row backwards, ‘Hold’– stop rowing, ‘HOLD! 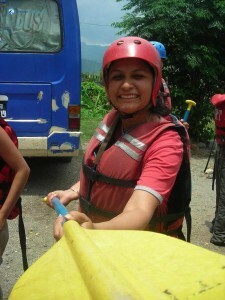 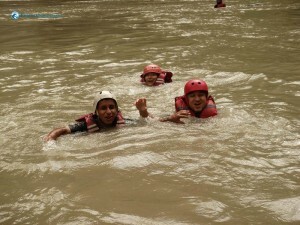 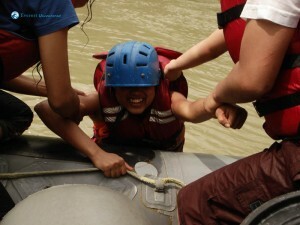 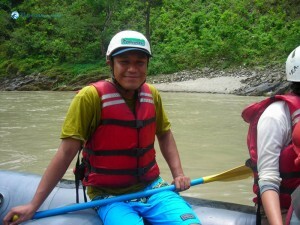 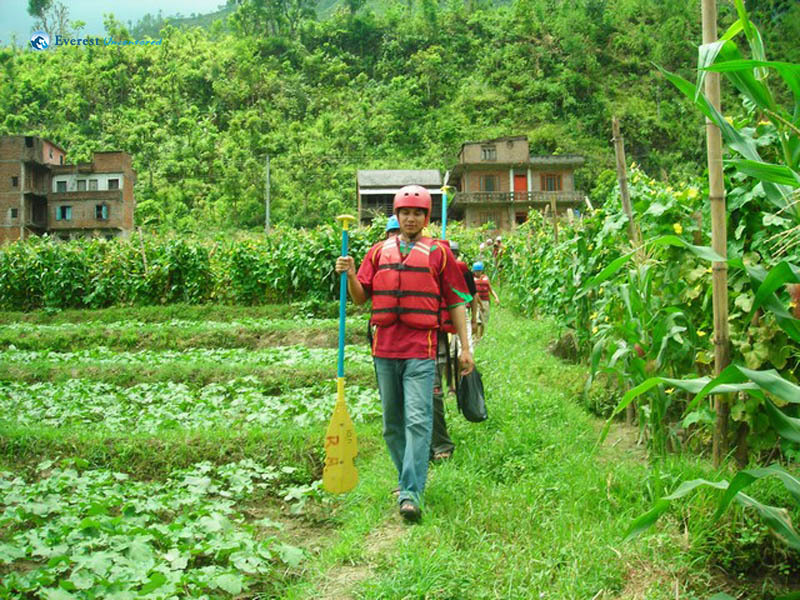 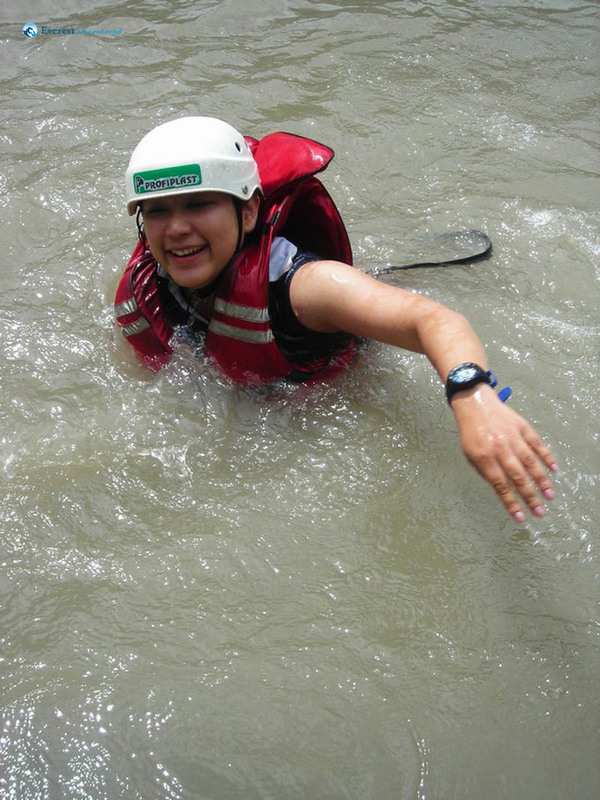 (With a scream from the guide)’ – hold on to the rope tied around the raft and duck in the raft. Simple, eh! 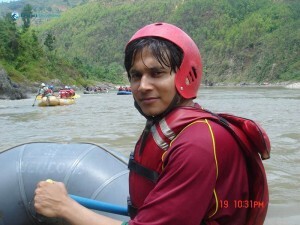 But I guess everyone was thinking, ‘how am I going to row when I am in the middle of the rapids’, as there was an eerie silence while the guide was giving out instructions and rescue tips. 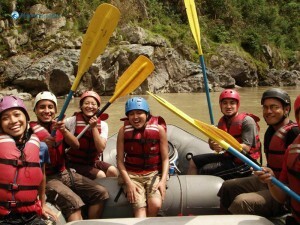 Excited and ready as we all were, without any doubt, we were already rowing our raft down the river the next moment. 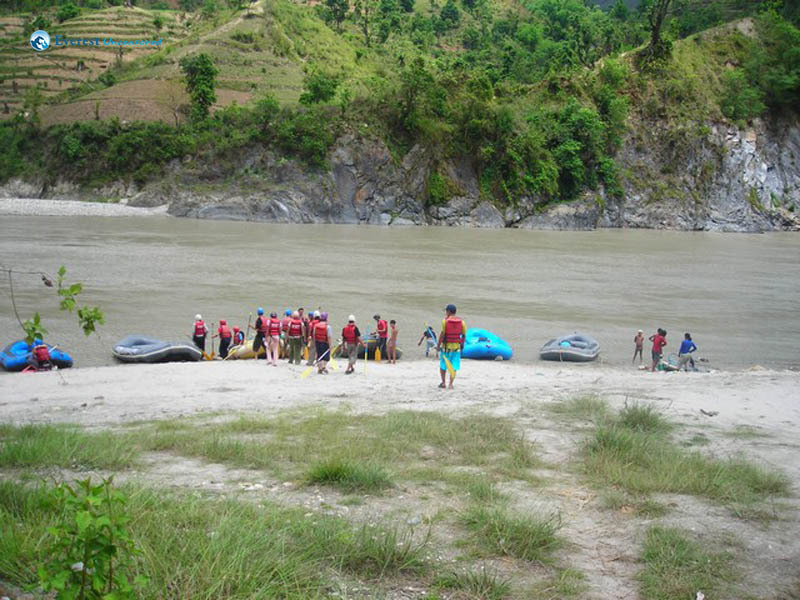 What followed during the next 3 and half hours’ rafting course is something I cannot put in words. One has to experience it to really know how it feels. 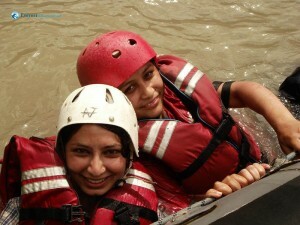 There were around 7-8 rapids ranging from grade 3 to grade 5+. 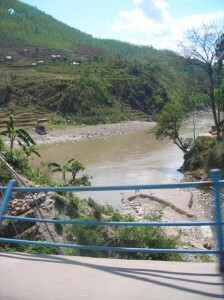 There was ‘Landslide’, ‘Lady’s Delight’, ‘Bijuli’, ‘Monsoon’, ‘Surprise’ ,’Upset’, etc. 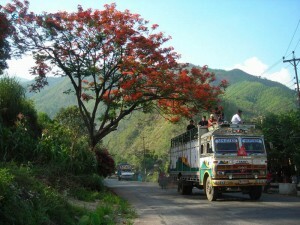 each carrying its own signature and thrill. 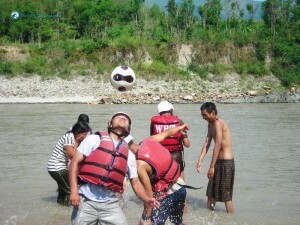 We were all ecstatic fighting the rapids. 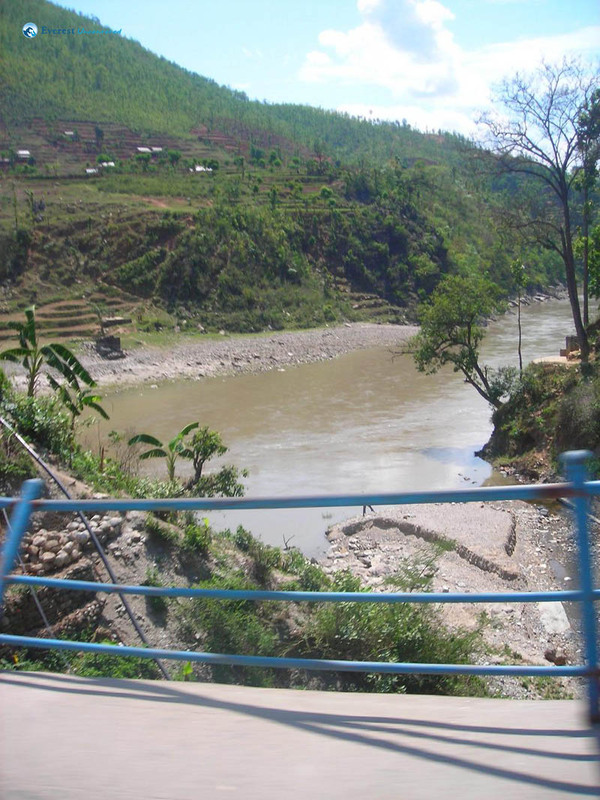 The river was literally dancing with the water going up and down, swirling, swiveling and surprising us on many occasions. 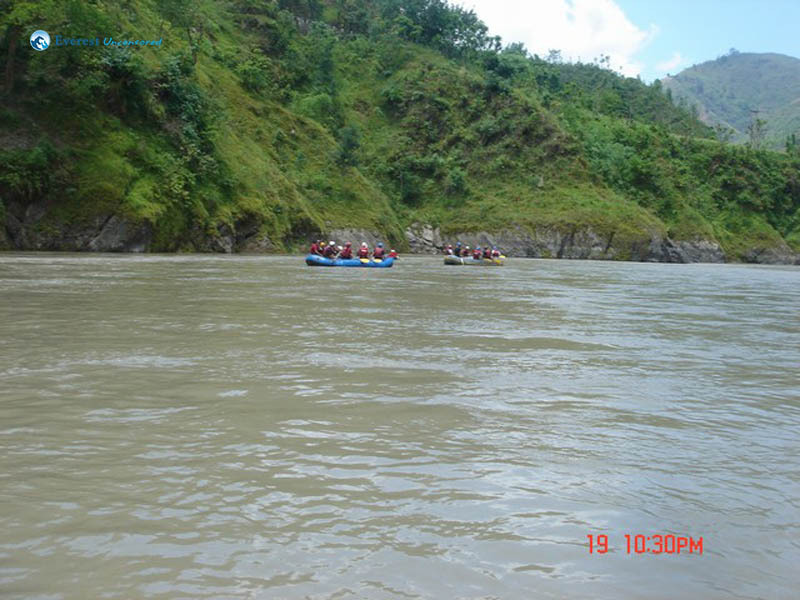 Of the four rafts that we had taken, there was one leaking raft on which on board were Sajan, Asim, Tejaswi, Smriti, Shamesh and others. 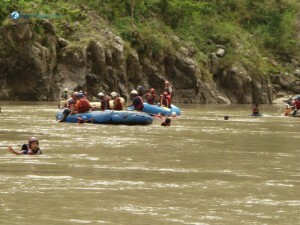 It had drawn everybody’s serious attention as we were not even half way down the course, and the raft was already in a bad condition. 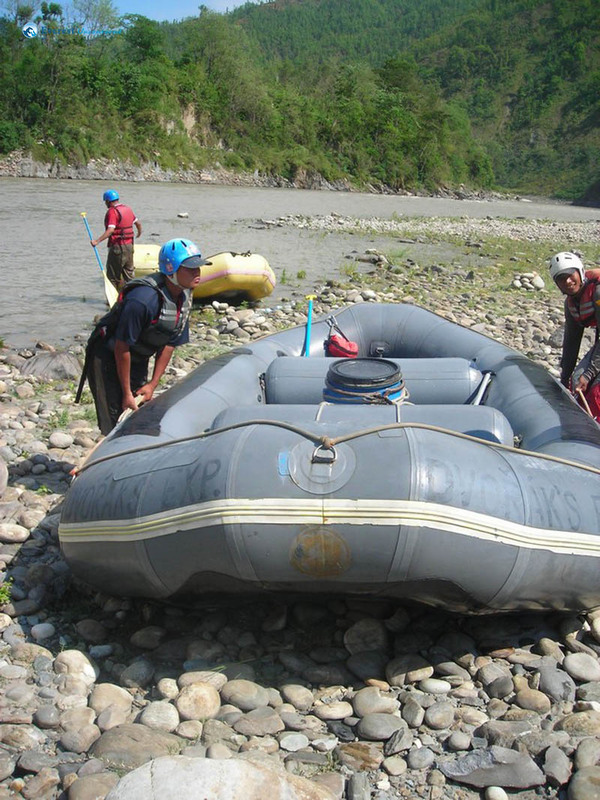 Nevertheless the guys did manage to pull it ashore at the destination with a ‘little’ extra effort. Another scary incident was one when the raft carrying Siris, Sajan, Rashmi and her sisters, Niraj and Pradipna almost overturned in a rapid, after hitting a boulder. They reminisce it with great excitement, thanking their good fortune. 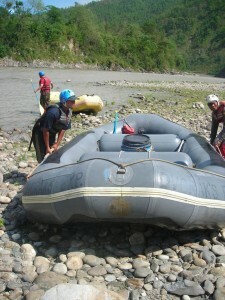 I cannot even imagine what it would have been like, clinging on to the raft, Powerless. 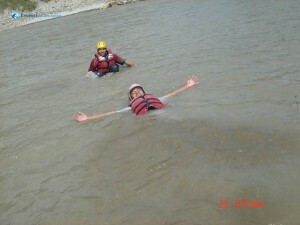 Apart from those two incidents, we had few wonderful swim sessions in calmer sections of the river. 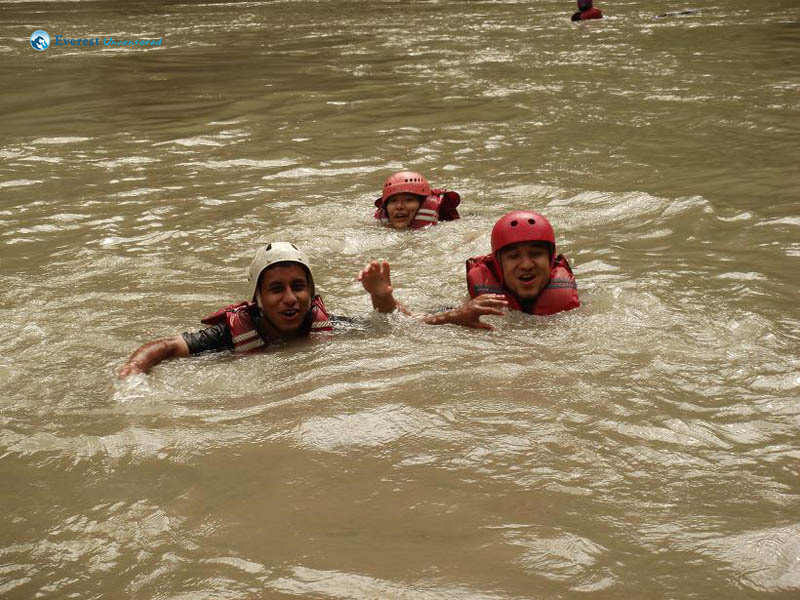 Many dived into the river and I was also one of them, and swimming in a river for the first time was something very ‘new’ and exciting. 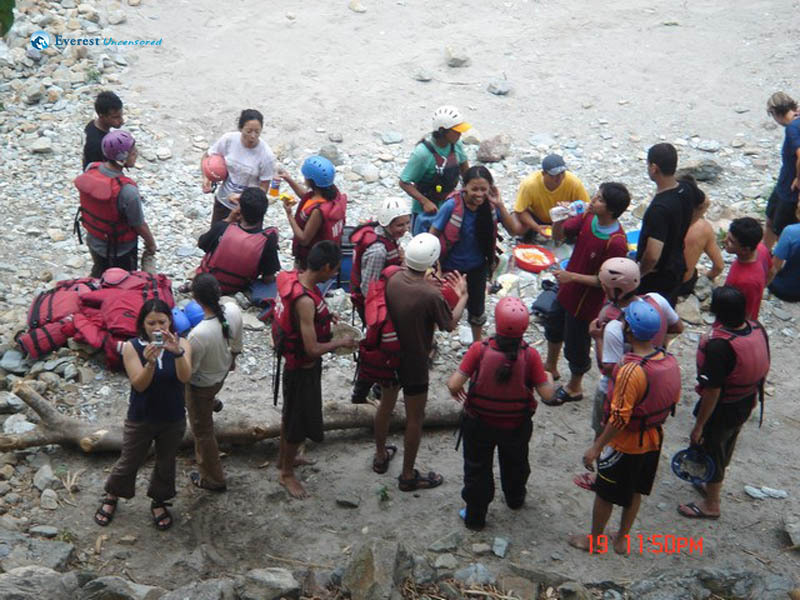 We finally reached Kurintar around 4, where we put down our oars. We had our delicious lunch and after a rest of an hour or so, we were on wheels heading back to Kathmandu. 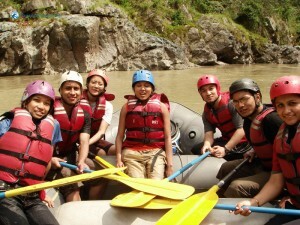 A three and half hours rafting with a heavy meal had all of us bloated to a maximum, I guess, because on the way back home, our bus tyre punctured causing a delay of half an hour. 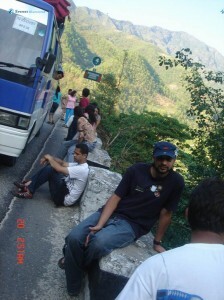 With the puncture fixed and a sigh of relief, our bus resumed its journey back home along the sinuous road. 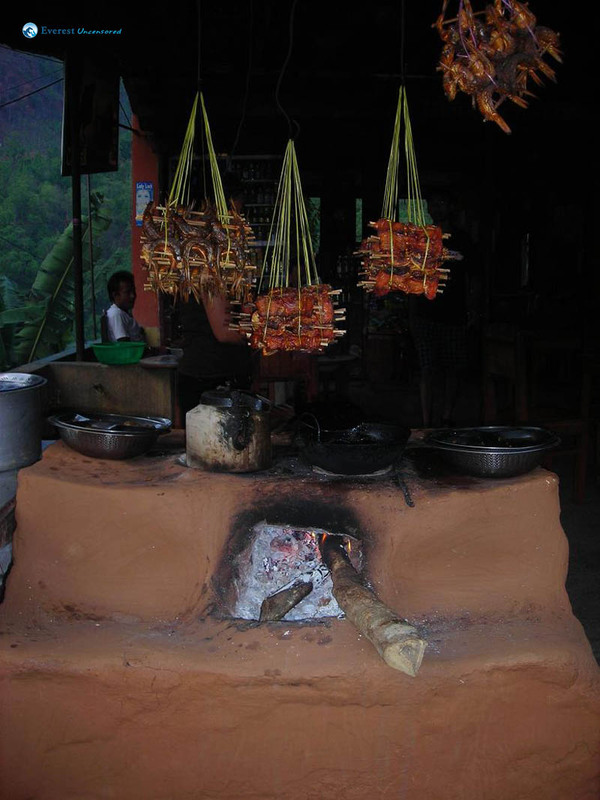 We also stopped by at Malekhu on the way to have some of the very famous local Malekhu fish.